Dr. Dixon began at Georgia Tech in August 2009 as an Assistant Professor. Prior to his current appointment, he was a staff scientist at Ecole Polytechnique Federal de Lausanne (Swiss Federal Institute of Technology - Lausanne) doing research on tissue-engineered models of the lymphatic system. Dr. Dixon received his Ph.D. in biomedical engineering while working in the Optical Biosensing Laboratory, where he developed an imaging system for measuring lymphatic flow and estimating wall shear stress in contracting lymphatic vessels. Dr. Dixon's research focuses on elucidating and quantifying the molecular aspects that control lymphatic function as they respond to the dynamically changing mechanical environment they encounter in the body. Through the use of tissue-engineered model systems and animal models, our research is shedding light on key functions of lymphatic transport, and the consequence of disease on these functions. One such function is the lymphatic transport of dietary lipid from the intestine to the circulation. Recent evidence from our lab suggests that this process involves active uptake into lymphatics by the lymphatic endothelial cells. There are currently no efficacious cures for people suffering from lymphedema, and the molecular details connecting lymphedema severity with clinically observed obesity and lipid accumulation are unknown. Knowledge of these mechanisms will provide insight for planning treatment and prevention strategies for people facing lipid-lymphatic related diseases. Intrinsic to the lymphatic system are the varying mechanical forces (i.e., stretch, fluid shear stress) that the vessels encounter as they seek to maintain interstitial fluid balance and promote crucial transport functions, such as lipid transport and immune cell trafficking. Thus, we are also interested in understanding the nature of these forces in both healthy and disease states, such as lymphedema, in order to probe the biological response of the lymphatic system to mechanical forces. The complexity of these questions requires the development of new tools and technologies in tissue engineering and imaging. In the context of exploring lymphatic physiology, students in Dr. Dixon's laboratory learn to weave together techniques in molecular and cell biology, biomechanics, imaging, computer programming, and image and signal processing to provide insight into the regulation of lymphatic physiology. Students in the lab also have the opportunity to work in an interdisciplinary environment, as we collaborate with clinicians, life scientists, and other engineers, thus preparing the student for a career in academia and basic science research, or a career in industry. 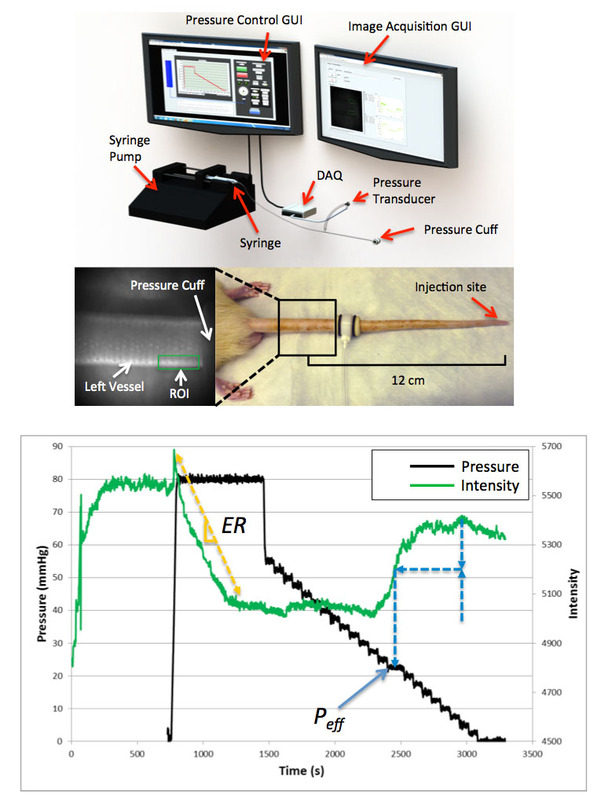 Figure legend: The effective lymphatic pumping pressure (Peff) is determined using a novel, feedback controlled imaging system in which a pressure cuff is inflated to occlude flow. Vessel transport function is tracked throughout the procedure by imaging lymphatic uptake of an intradermally injected near infrared (NIR) tracer. The cuff is then gradually deflated, while the restoration of flow is observed with an NIR imaging system. Both the rate of vessel emptying (ER) and Peff are determined, through automated image processing algorithms, as measures indicative of overall lymphatic pump function performance. Dixon, J. B., “Lymphatic lipid transport: Sewer of subway?”, Trends in Endocrinology and Metabolism, 21(8), 480-487, 2010. Kassis, T., Kohan, A. B., Weiler, M., J., Nipper, M. A., Cornelius, R., Tso, P., and Dixon, J. B., “A dual channel in situ optical imaging system for quantifying lipid uptake and lymphatic pump function in vivo”, Journal of Biomedical Optics, 17(8), 086005(1-13), 2012. Weiler, M. and Dixon, J., B., “Differential transport function of lymphatic vessels in the rat tail model and the long term effects of Indocyanine Green as assessed with near-infrared imaging”, Frontiers in Vascular Physiology, 4(215), 1-10, 2013. Reed, A.L., Rowson, S.A., and Dixon, J. B., “Demonstration of ATP-dependent transcellular transport of lipid across the lymphatic endothelium using an in vitro model of the lacteal”, Pharmaceutical Research, 30(12), 3271-3280, 2013. Nelson, T. S., Akin, R. E., Weiler, M. J., Kassis, T., Kornuta, J. K., and Dixon, J.B., “Minimally invasive method for determining the effective lymphatic pumping pressure in rats using near infrared imaging”, American Journal of Physiology – Regulatory, Integrative, and Comparative Physiology, (in press), 2014.